Synthetic peptide within Human Neuropilin 1 aa 900 to the C-terminus (intracellular). The exact sequence is proprietary. Our Abpromise guarantee covers the use of ab81321 in the following tested applications. WB 1/1000 - 1/2000. Predicted molecular weight: 103 kDa.Can be blocked with Neuropilin 1 peptide (ab189308). IHC-P 1/100 - 1/400. Perform heat mediated antigen retrieval with Tris/EDTA buffer pH 9.0 before commencing with IHC staining protocol. Flow Cyt 1/50 - 1/70. The epitope that the antibody recognizes is intracellular. Fixation and permeabilization are necessary. The membrane-bound isoform 1 is a receptor involved in the development of the cardiovascular system, in angiogenesis, in the formation of certain neuronal circuits and in organogenesis outside the nervous system. It mediates the chemorepulsant activity of semaphorins. It binds to semaphorin 3A, The PLGF-2 isoform of PGF, The VEGF-165 isoform of VEGF and VEGF-B. Coexpression with KDR results in increased VEGF-165 binding to KDR as well as increased chemotaxis. 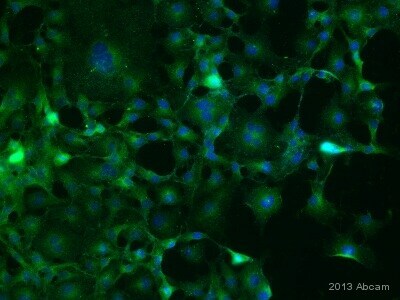 It may regulate VEGF-induced angiogenesis. The soluble isoform 2 binds VEGF-165 and appears to inhibit its binding to cells. It may also induce apoptosis by sequestering VEGF-165. May bind as well various members of the semaphorin family. Its expression has an averse effect on blood vessel number and integrity. The expression of isoforms 1 and 2 does not seem to overlap. Isoform 1 is expressed by the blood vessels of different tissues. In the developing embryo it is found predominantly in the nervous system. In adult tissues, it is highly expressed in heart and placenta; moderately in lung, liver, skeletal muscle, kidney and pancreas; and low in adult brain. Isoform 2 is found in liver hepatocytes, kidney distal and proximal tubules. Belongs to the neuropilin family. Contains 2 F5/8 type C domains. Immunohistochemistry (Formalin/PFA-fixed paraffin-embedded sections) - Anti-Neuropilin 1 antibody [EPR3113] (ab81321)Image fro Pérez-Lozano ML et al., PLoS One. 2013;8(4):e60776. Fig 6.; doi: 10.1371/journal.pone.0060776. The expression of Neuropilin 1 and the mesothelial marker cytokeratin was analyzed in human peritoneal specimens by immunohistochemistry. Positive cells for antibodies used (Neuropilin 1 (ab81321) and Cytokeratin) show brown staining. Nuclei are counterstained in blue. (a, b) Control peritoneal tissue, with a conserved mesothelial cell monolayer showing an epithelioid morphology (with a 20X objective). These cells show weak expression of Neuropilin 1 and a marked staining for cytokeratin (arrows). No expression of these proteins was observed in the submesothelial area (region under mesothelial monolayer) (c, d) Fibrotic tissue sample from peritoneal dialysis (PD) patient showing the loss of mesothelial monolayer and invading spindle-like mesothelial cells in submesothelial area (with a 40X objective). These cells present a strong staining for Neuropilin 1 (c), and are also positive for cytokeratin (d) (arrows). Pictures are representative of 5 cases of PD patient samples and 4 of control samples. Immunocytochemistry/ Immunofluorescence - Anti-Neuropilin 1 antibody [EPR3113] (ab81321)Image fro Pérez-Lozano ML et al., PLoS One. 2013;8(4):e60776. Fig 5.; doi: 10.1371/journal.pone.0060776. The expression of Neuropilin 1, VEGFR-2, and VEGF was analyzed by immunofluorescence microscopy in omentum and effluent-derived mesothelial cells (MCs). MCs were double stained for Neuropilin 1 (green) and VEGFR-2 (red), and single stained for VEGF (green). Nuclei were stained with DAPI. Neuropilin 1 and VEGF show a membrane distribution in omentum and epithelioid MCs (b, c, h, i). During in vitro (e, f) and ex vivo (k, l) MMT both proteins change their localization and are internalized. The expression of VEGFR-2 is down-regulated but it does not show differences in localization during in vitro (a, d) and ex vivo (g, j) MMT. Immunohistochemistry (Formalin/PFA-fixed paraffin-embedded sections) analysis of human liver tissue labelling Neuropilin 1 with purified ab81321 at 1/400. Heat mediated antigen retrieval was performed using Tris/EDTA buffer pH 9. ab97051, a HRP-conjugated goat anti-rabbit IgG (H+L) was used as the secondary antibody (1/500). Negative control using PBS instead of primary antibody. Counterstained with hematoxylin. Unpurified ab81321 staining Neuropilin 1 in the COS1 fibroblast-like cell line derived from monkey kidney tissue by ICC/IF (Immunocytochemistry/immunofluorescence). Cells were fixed with paraformaldehyde, permeabilized with Triton X-100 0.1% and blocked with 10% serum for 60 minutes at 24°C. Samples were incubated with primary antibody (1/200) for 16 hours at 4°C. An Alexa Fluor® 488-conjugated goat anti-rabbit monoclonal(1/500) was used as the secondary antibody. Flow Cytometry analysis of MCF7 cells labelling Neuropilin 1 with purified ab81321 at 1/70 (red). Cells were fixed with 2% paraformaldehyde. A FITC-conjugated goat anti-rabbit IgG (1/150) was used as the secondary antibody. Black - Isotype control, rabbit monoclonal IgG. Blue - Unlabelled control, cells without incubation with primary and secondary antibodies. Immunohistochemistry (Frozen sections) - Anti-Neuropilin 1 antibody [EPR3113] (ab81321)Image courtesy of an anonymous Abreview. 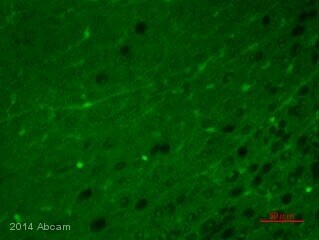 Unpurified ab81321 staining Neuropilin 1 in rat brain tissue sections by Immunohistochemistry (frozen sections). Tissue was fixed with paraformaldehyde and then blocked with 10% serum for 1 hour at 27°C followed by incubation with the primary antibody, undiluted, for 14 hours at 4°C. An undiluted Cy3® conjugated donkey anti-rabbit was used as the secondary antibody. 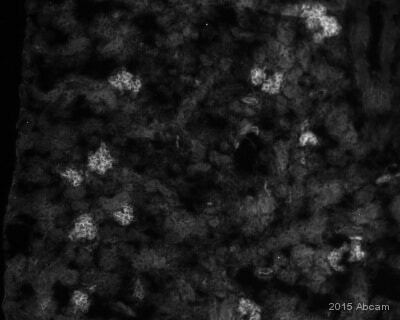 ICC/IF image of unpurified ab81321 stained MCF7 cells. The cells were 4% PFA fixed (10 min) and then incubated in 1%BSA / 10% normal goat serum / 0.3M glycine in 0.1% PBS-Tween for 1h to permeabilise the cells and block non-specific protein-protein interactions. The cells were then incubated with the antibody (unpurified ab81321, 5µg/ml) overnight at +4°C. The secondary antibody (green) was DyLight® 488 goat anti-rabbit IgG - H&L, pre-adsorbed (ab96899) used at a 1/250 dilution for 1h. Alexa Fluor® 594 WGA was used to label plasma membranes (red) at a 1/200 dilution for 1h. DAPI was used to stain the cell nuclei (blue) at a concentration of 1.43µM. Overlay histogram showing HepG2 cells stained with unpurified ab81321 (red line). The cells were fixed with 4% paraformaldehyde (10 min) and then permeabilized with 0.1% PBS-Tween for 20 min. The cells were then incubated in 1x PBS / 10% normal goat serum / 0.3M glycine to block non-specific protein-protein interactions followed by the antibody (unpurified ab81321, 1/50 dilution) for 30 min at 22°C. The secondary antibody used was DyLight® 488 goat anti-rabbit IgG (H+L) (ab96899) at 1/500 dilution for 30 min at 22°C. Isotype control antibody (black line) was rabbit monoclonal IgG (0.5µg/1x106 cells) used under the same conditions. Acquisition of >5,000 events was performed. This antibody gave a significantly decreased signal in HepG2 cells fixed with methanol (5 min)/permeabilized in 0.1% PBS-Tween used under the same conditions. 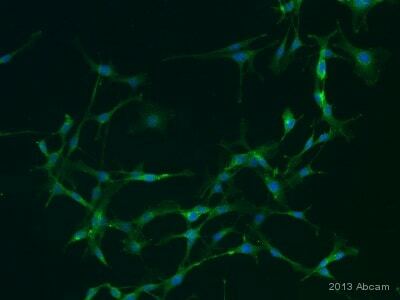 Immunocytochemistry/Immunofluorescence analysis of HUVEC cells labelling Neuropilin 1 with purified ab81321 at 1/250. Cells were fixed with 4% paraformaldehyde and permeabilized with 0.1% Triton X-100. ab150077, an Alexa Fluor® 488-conjugated goat anti-rabbit IgG (1/500) was used as the secondary antibody. DAPI (blue) was used as the nuclear counterstain. ab7291, a mouse anti-tubulin (1/1000) and ab150120, an Alexa Fluor® 594-conjugated goat anti-mouse IgG (1/500) were also used. Control 1: primary antibody (1/250) and secondary antibody, ab150120, an Alexa Fluor® 594-conjugated goat anti-mouse IgG (1/500). Unpurified ab81321 staining Neuropilin 1 in mouse brain tissue sections by Immunohistochemistry (IHC-P - formaldehyde-fixed, paraffin-embedded sections). Tissue was fixed with formaldehyde and blocked with 10% serum for 1 hour at room temperature; antigen retrieval was by heat mediation in citrate buffer (pH 6). Samples were incubated with primary antibody (1/100 in PBS + 2% blocking serum) for 16 hours at 4°C. A biotin-conjugated goat anti-rabbit IgG polyclonal (1/250) was used as the secondary antibody. Immunohistochemical analysis of frozen human kidney tissue sections labelling Neurophilin 1 with ab81321 at a concentration of 1/100 for 18 hours at 4°C. The antibody was then blocked with a serum free protein block for 1 hour at 21°C. The secondary antibody used was a donkey anti-rabbit antibody conjugated to an Alexa488® dye inclubated at 1/400. Publishing research using ab81321? Please let us know so that we can cite the reference in this datasheet. Could you recommend an isotype control antibody for neuropilin 1? See attachment. We can recommend ab125938 (Rabbit IgG, monoclonal [SP137] - isotype control) as isotype control for rabbit monoclonal primary antibodies. https://www.abcam.com/index.html?datasheet=125938 (or use the following: https://www.abcam.com/index.html?datasheet=125938). Nous avons 3 abreviews pour IHC-P avec ab81321, un chez l’humain (26 October 2012) et deux chez la souris (28 March 2012, 22 June 2010.) Ces trois abreviews montrent des bons résultats en utilisant l’anticorps à une dilution de 1/100 ou 1/200. Nous recommandons d’utiliser plutôt une dilution de 1/100 sur la nuit à 4ºC. Nous recommandons de faire un démasquage antigène avec du tampon de citrate pH6. Les résultats des abreviews montrent aussi que de fixer les cellules avec 4% PFA et de bloquer avec 10% sérum est recommandé.